We welcome you to our internet site. It would be our honour to meet you and suggest the best possible solution for your needs. 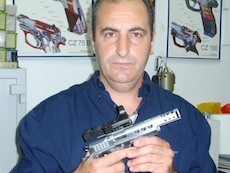 Our gunsmith shop was established in 2008 (under the direction of Anastasia Archontaki - Kyriakaki) by Antonis Kyriakakis, retired Air Force officer (with specialty gunsmith) with more than 25 years of experience in light weapons. Our wide range of partnerships allows us to offer exceptional prices over a great range of weapons. In addition, we offer reliable and continuous after-sales support for our products.